35 years ago tonight (1980) – The Isles advanced to the Stanley Cup Final for the first time in their history with a 5-2 win over Buffalo, as they clinched their semi-final series, 4 games to 2. Gilbert Perreault had given the Sabres a 2-0 first period lead with a pair of goals -- it gave Perreault five goals in the last three periods at the Coliseum and six goals in the series – all at the Coliseum. But those were the last goals that Buffalo would score in the series. John Tonelli got one of the goals back, at 8:08 of the first period and the Isles got even on a power play goal by Mike Bossy 31 seconds into the second period. “We were a little too nervous at the start, and the crowd’s noise didn’t help us get going in the right direction. We were too hyped up already”, Mike Bossy told the NY Times Parton Keese. So who got what turned out to be the series-clinching goal? 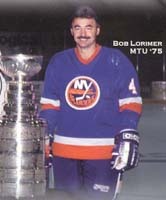 It turned out to be Bob Lorimer, whose first goal of the playoffs made it 3-2 midway through the second period. “I went into the slot, and Butchie (Goring) got the puck to me. I had a foot of open net, and I quickly put it in.” It was one of three playoff goals Lorimer scored for the Isles. Duane Sutter gave the Isles some insurance at 11:50 of the third period and Bob Bourne completed the scoring with a shorthanded, empty net tally. Billy Smith finished with 22 saves as the Isles eliminated the Sabres for the third time in five years. Smith recorded all 12 wins in those three series; he had more playoff wins against only one opponent – the Rangers (18-5). Also on this date: (1984) Kevin McClelland scored the game’s only goal at 1:55 of the third period as the Edmonton Oilers took their first step towards dethroning the Islanders with a 1-0 victory. Grant Fuhr finished with 33 saves as the Isles were blanked in the Stanley Cup Final for the only time in their history. All-time, the Isles played two playoff games on May 10th at the Coliseum; they compiled a 1-1 playoff record on this date at 1255 Hempstead Turnpike in Uniondale.